Why Buy “Made in China”? I just recently read an article on MSNBC about the latest defective product made in China – drywall. According to the Associated Press, “the Centers for Disease Control says prolonged exposure to the compounds found in the drywall, especially high levels of carbon disulfide, can cause breathing problems, chest pains and even death; and can affect the nervous system.” Ok, I’m scared – are you scared? So why is it that we keep importing products from China on a regular basis as if they’re working with a pristine track record? What marketing ploy is responsible for US citizens buying from China even though China has been known to sell defective merchandise.. Besides the defective dryway, there are many other notable representative “Made in China” products of the same defective caliber: tainted baby formula, lead based toys, melamine tainted candies, and sub par prescription drugs. I seriously had a thought wave trying to understand why Americans still import twice as much product from China as we export. I can’t recall ever seeing anything marketed specifically as a product of China. 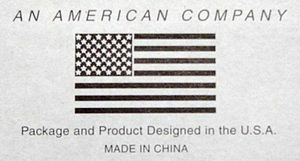 The fact that products made in China are not under one big “Made in China” brand may contribute to Americans disassociation between all “Made in China” products and China’s highly publicized flawed products. Yet, the tie that does binds all of the “Made in China” products together is the word cheap: cheap labor, cheap materials, thus cheap prices. So why is it that we keep importing products from China on a regular basis? It’s obviously the price. I can’t say any of the other 3 marketing mixes (Product, Place and Promotion) are a factor. The country’s reputation is surely shot to hell and therefore can’t be used to lure buyers. Seriously, what would a promotional ad for a “Made in China” product say: “Buy From China – We Sell Defective Products”? Obviously, the fact that many products are made under different brands belies buyers inability to connect “cheap” to “defective”, thereby allowing lower pricing to keep Chinese imports on American shelves.